A lot of companies have had enough with the whole recruitment process and are looking for ways to simplify or completely remove every stage involved with HR and its many ongoing requirements. BOSS is seeing a big move towards online bookkeeping services amongst every size of businesses. This week Seek announced they would be giving employers the opportunity to mask the names of candidates as they search through their site. They call this the Hide Names tool which they feel will offer hirers a chance to choose a group of talent for their shortlists before knowing what background candidates come from. The Hide Names tool can be switched on and off throughout the process to see more candidate details. However, although the Australian Bureau of Statistics (ABS) found when trialling their own blind recruitment strategy, that 50% more females were hired for senior management roles, another government study found that by not identifying candidates it reduced the probability of hiring women overall. The initiative was set up to address any gender and racial bias when looking for new hires. By focusing on candidates skills and experience rather than their names, potential unconscious bias could be circumvented. Are the salaries being offered fair? Is the language suitable for representing your company in your job ad? Want More Staff But Don’t Want to Bother With Recruiting…… EVER? If you’ve simply had enough with the whole recruitment process, with its very high costs involved in drawing in the best candidates for your company, training the new recruit with all the expenses involved and then retaining them and you’d like to put all those dollars back into your business, check out BOSS’ newest online bookkeeping service which offers firms a way to remove every recruitment task. 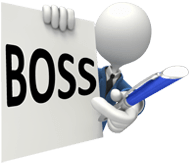 BOSS hires, trains and retains staff on your behalf and you’re none the wiser all this is taking or will ever take place!